ROME (CNS) — After walking across the threshold of the Holy Door with an Orthodox metropolitan and an Anglican archbishop, Pope Francis invoked God’s mercy upon divided Christians and apologized for times that Catholics may have hurt members of other denominations. 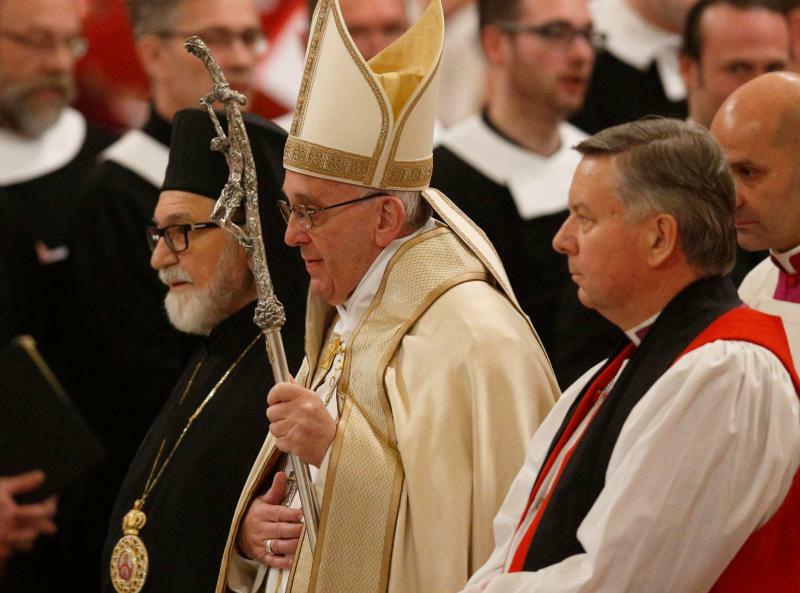 “As bishop of Rome and pastor of the Catholic Church, I want to beg for mercy and forgiveness for un-Gospel-like behavior on the part of Catholics against Christians of other churches,” the pope said Jan. 25 at a prayer service concluding the Week of Prayer for Christian Unity. “We ask most of all for forgiveness for the sin of our divisions, which are an open wound on the body of Christ,” Pope Francis said. As is customary, Pope Francis led the service at Rome’s Basilica of St. Paul Outside the Walls, which tradition holds as the burial site of the apostle. Orthodox Metropolitan Gennadios, representing the ecumenical patriarch, and Anglican Archbishop David Moxon, representing the archbishop of Canterbury, joined the pope in prayer at St. Paul’s tomb at the beginning of the service. St. Paul and countless Christian martyrs throughout the centuries gave their lives for their faith in Christ and now enjoy “full communion in the presence of God the father,” the pope said in his homily. He prayed the martyrs would sustain today’s Christians with their prayers and their example. The annual week of prayer ends Jan. 25, the feast of the Conversion of St. Paul. Pope Francis told those gathered in the basilica that “the superabundance of God’s mercy” was the only basis for Paul’s conversion from being a persecutor of Christians to a preacher of the Gospel. Mercy saved him, and proclaiming that mercy to others was the mission he received. For the 2016 week of prayer, the Pontifical Council for Promoting Christian Unity and the World Council of Churches chose the theme, “Called to proclaim the mighty acts of the Lord,” which is drawn from some translations of the second chapter of the First Letter of Peter. Being chosen for salvation, the pope said, inspires “comfort and constant awe” among Christians today just like in the days of Sts. Peter and Paul. “Why me, Lord? Why us,” Christians should and do ask. The answer, Pope Francis said has to do with “the mystery of mercy and of God’s choice: The father loves everyone and wants to save all,” so he chooses people and sends them out to share God’s mercy and love with others. The path to Christian unity, he said, is not simply about drawing closer to one another, but has more to do with each person drawing closer to Christ and finding each other there.